Ontario brown ale is a species of what the BJCP calls British Brown Ale. The term “species” is justified I think. Brown ale continues to be brewed in the province since inception of modern craft brewing and various examples show a family resemblance. I haven’t encountered a group of craft browns elsewhere with quite the same characteristics. It’s an Ontario thing, it seems. 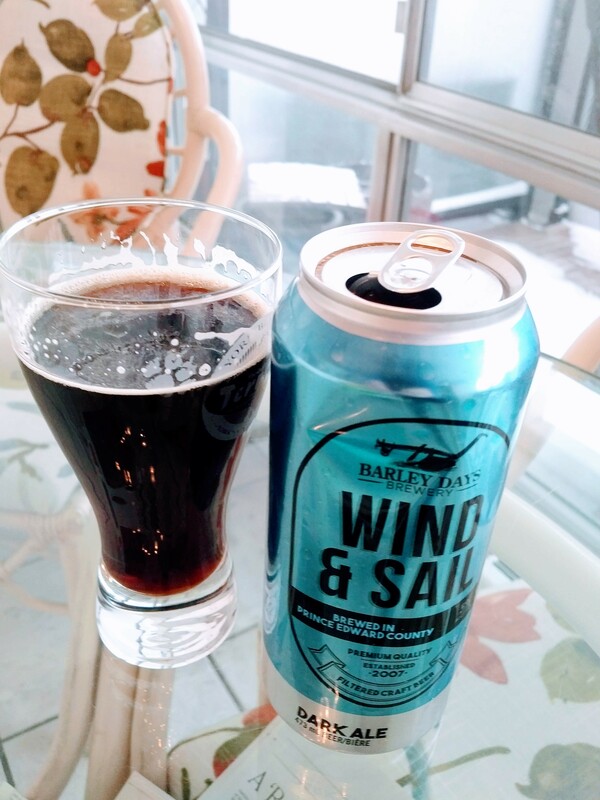 The beer shown, Barley Days Wind and Sail from Picton, ON in Prince Edward County, exemplifies the type: lightly malty with cocoa and chocolate tones. It has good but not pronounced hopping, of the neutral, old world type. (No “citrus”, that term beloved of 10,000 beer labels). Ontario brown ale achieves the profile simply with a blend of barley malts: no chocolate or coffee added, a good thing for our taste. Other examples are Amsterdam Downtown Brown, Upper Canada Dark Ale, Wellington County Ale, Black Oak Nut Brown Ale, and Waterloo Dark*. They are about 5% ABV, good for drinking a couple, good with food. Each has its merits, with a different accent on the cocoa or chocolate, acidity level, hopping, etc. The beers by current standards are not greatly impactful but in truth offer excellent drinking. There is a time and place for each style, or each taste. Put another way, this one is a lover not a fighter. Tall dark and handsome. It helps to drink them at not much cooler than room temp, and not too gassy – easy to adjust with a debonair stir of the swizzle. These beers are like keg mild in Britain but stronger, or like Samuel Smith’s Nut Brown Ale, Double Maxim Brown Ale, and Mann’s Brown Ale, influencers in the early days of craft. Regretfully I must exclude Newcastle Brown Ale since recent tastings disclose little flavour, imo. BJCP, a judging certification group, takes pains to explain that British Brown Ale is not a historical type or intended, when grouped with porters and mild ales, to suggest any common origins. I get that, but the beers can in practice resemble each other, and the grouping makes sense. Barley Days’ brown could be taken for a light porter, in fact. Conversely, some beers labelled porter or stout in Canada are similar to Ontario brown, Moosehead’s new Export Stout, say, or Mad and Noisy Coconut Porter from Creemore. Barley Days has pleased (me) more than disappointed lately. As I reported earlier its buck a beer entrant to our Premier’s plea for cheaper beer, Loon Lager, is an excellent light Munich blonde, or Helles. The LCBO listings have it now at $1.65 a can so I guess the special has ended, but I’ll still buy it. A canned Loyalist Lager and Harvest Gold Pale Ale pleased much less, not enough taste. I won’t repeat. *Described as a lager on the website of Waterloo Brewing but partakes of the general character I’ve described for Ontario brown ale, imo. Other Ontario dark lagers are more frankly in the classic Munich Dunkel mode. **Picton is a charming resort town some two hours drive east of Toronto, on Lake Ontario. There are many notable features there redolent of its geography or history, from countless sunken wrecks off the shore, to the famous sand dunes just outside of town, to the RAF presence in WW II to teach flying and gunnery. It’s well-known for a growing winery scene, more than breweries in fact, but many farms continue in operation and supply both activities. Picton was settled by United Empire Loyalists, Americans who elected to stay with the Crown during the American Revolution. They came starting in the 1780s. Canadians have justly evolved a distinct character but Americans formed the corpus of settlement in Ontario. This has had an obvious influence on our life and mores. There is much more that unites us than separates, in that while settlement was superintended by the British, enduring social and cultural norms arrived with people who had lived in America for 100 years or more before decamping to Upper Canada. More information on Picton here. Room temp is the wrong answer to the ale drinking temperature. The right answer…it depends! But I always say cool, not cold works best for British ales. But taking all with all, around 60 F. sounds good, and into the fifties won’t hurt.